By the end of the course your knowledge and comfort level will have increased. The Deep Diver course has a maximum depth of 40m/130, the suggested sport diving limit. The two dives will be completed from our dive charter boat, Stingray . 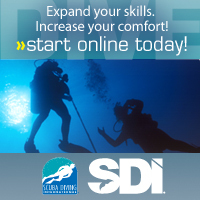 Advanced Adventure Scuba Diver course.